Hey there. 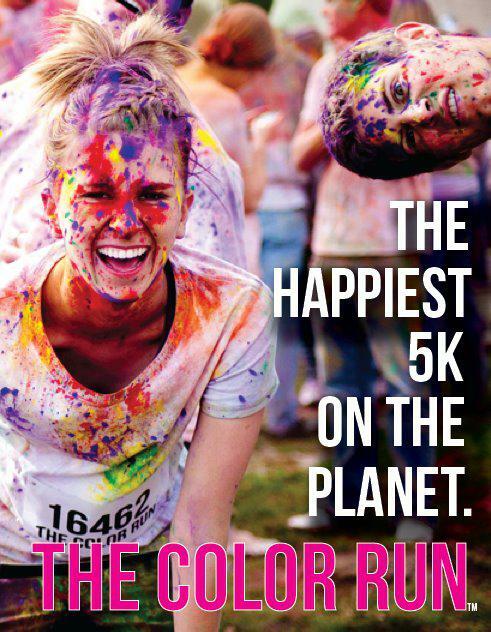 Guess who just signed up to do The Color Run in the city of Irvine this April?!?! That's right! This guy! I told myself that I wanted to do some more running this year. I started the year well by doing a good 5 mile run about 3 times a week but have kind of ventured off from that pass. It's OK, though. I'm still staying in shape and am squeezing a workout here and there. But when I made that commitment to be in more shape this year, I told myself that running a 5K would be a goal. That goal is now going to happen on April 22nd!! If you guys haven't head of The Color Run, it's pretty damn cool. It's not so much about speed but more about enjoying yourself. You start off with a white colored shirt and at the 1K mark, you'll be splattered with paint. By the time you reach the end, you'll be covered in colors! Check out the video below of how much fun it can be! The Color Run just started their tour so it may still run through a city near you. If interested, check out their website and see if it'll go through your area! If you're in Southern California, hurry! They opened up an additional registration period for April 22nd. Spots fill up quickly so you best hurry or be left out. Have you guys done any running before? It's my first so I'm not exactly sure what to expect. Any ideas? Tips? Later!! !